As industry leaders work to redefine value in healthcare, payers and providers are offering access to the once-impenetrable healthcare marketplace for new technologies. As large healthcare systems and payers expand their own investment portfolios, they are becoming familiar with the value that startups can drive and how working with smaller, nimbler companies can be advantageous to the healthcare ecosystem as a whole. The breaking down of traditional barriers to entry in healthcare, as well as the convergence of the health tech and traditional tech spaces, is attracting a group of investors that had previously invested in other segments like retail, AI, and SaaS. In addition to higher risk-tolerance, these investors bring with them the willingness to invest larger amounts in earlier rounds, which helps accelerate growth, giving investable companies the boost they need to make the most of this shift in mentality. Smashing the previous five-year high of $112 million, raised in Q1 of 2018, Medical Alley companies took in $167 million in investment in the first quarter, powered by a medical device sector that had its best Q1 since 2015. 2017 was a such great year for Medical Alley startups — they raised nearly double the amount of capital that was raised in 2016 and 2015 — that it looked like an aberration. 2018 investment came in narrowly below 2017’s high-water mark, bringing what had previously been an outlier into line, and providing evidence of a change in investor behavior. With 2019 on a record-setting pace, and a clearer picture of a new mentality within healthcare beginning to form, it’s clear that 2017 wasn’t an aberration at all, it was the beginning of a shift that Medical Alley companies are positioned well to benefit from. For the first time since 2015, Medical Alley startups’ median raise for a quarter broke $2 million, a 136% year-over-year increase on the heels of a 30% year-over-year increase from 2017 to 2018. It’s Medical Alley’s early-stage companies that are driving up the median raise: Five of the 10 largest rounds this quarter came from companies taking their Series B round or earlier and of the top 13 rounds, seven were either Series A or seed rounds. 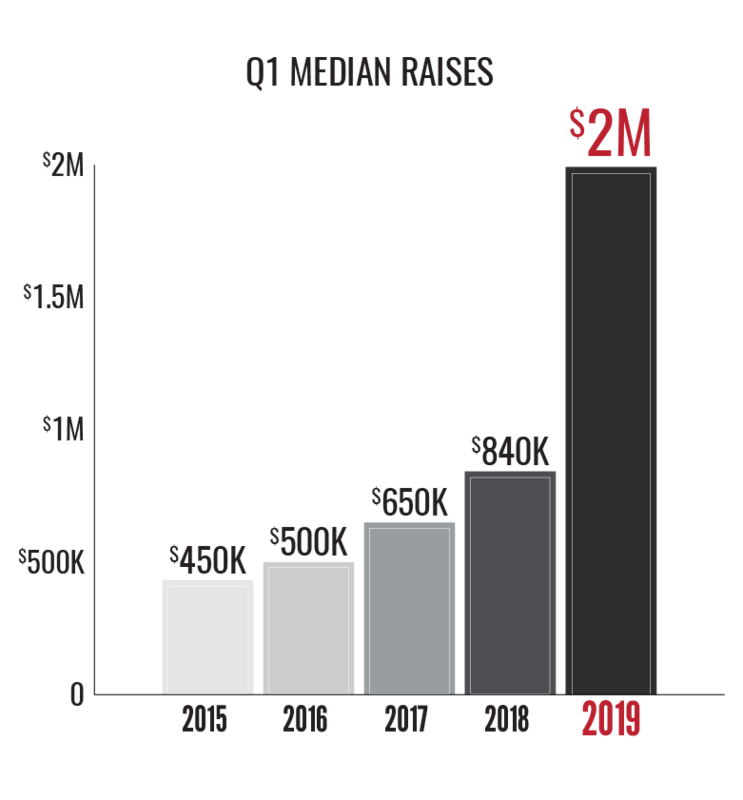 The high median isn’t an indication of a flat bottom, either: 27 companies raised money in Q1, matching the five-year median number of raisers in the first quarter. Higher investment totals for early-stage companies is commensurate with the shift in thinking within healthcare mention at the opening. As large health systems and payers search for ways to reduce costs while improving patient outcomes, they are increasingly willing to pilot new products or processes, champion them when appropriate, and even invest in them in some cases. But even without explicit investment from a health system or provider, the pathway to market for health technology startups is much clearer than it was previously, emboldening entrepreneurs and investors alike to offer a new path to value for patients and clinicians. 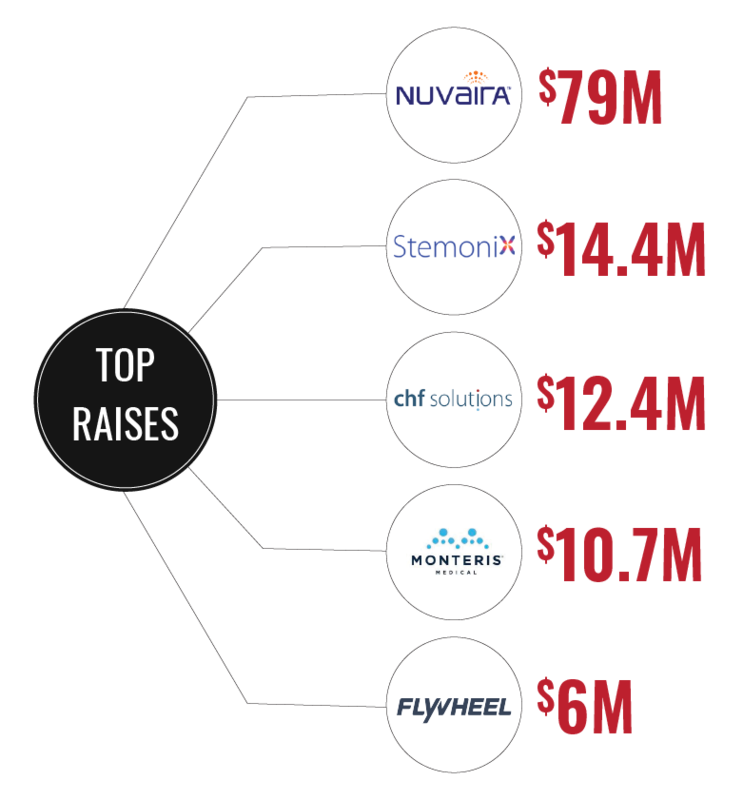 After being overtaken by a surge in digital health investments in 2018, medical device returned to the top of the sector fundraising charts, raising $133.3 million in total, led by Nuvaira’s quarter-best $79 million Series E raise. The company will use the funds to finish clinical trials as it seeks FDA approval for its novel COPD treatment. Medical device is a more diverse segment than the traditional pacemakers and implantable defibrillators and the companies that raised money in Q1 demonstrate just how wide the range of treatments provided by devices can be. From flexible circuits that monitor brain activity to a lower-leg treatment for peripheral neuropathy, Medical Alley companies are using innovative devices to treat an ever-expanding array of conditions. Despite the move to value-based healthcare substantially changing the investing landscape for health technology startups, some of the traditional challenges, like navigating the FDA approval process and securing reimbursement, will remain.  However, the Medical Alley community is the best in the world at helping companies overcome these challenges, which means that the startups here are in the best place they could be to grow quickly and get their life-changing ideas into the marketplace. With one record-breaking quarter already completed, and the landscape shifting in beneficial ways, 2019 is shaping up to be another outstanding year in Medical Alley!